Since 1994, Elite Force Martial Arts has provided its members with a road map to success based on self-defense, confidence and goal-setting skills. Hi, I'm Master Michael Sweeney. 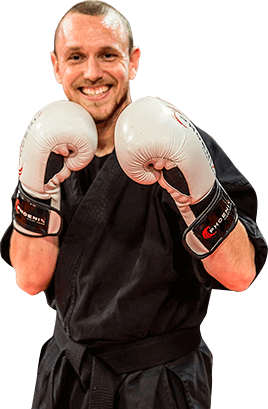 Michael began martial arts at the age of 16, nearly 20 years ago, to learn self-defense. To his surprise, he found confidence, focus, discipline, and guidance. Since finding his passion for helping himself as well as others reach their true potential... He ultimately became a Master Instructor. Our programs have a strong focus on personal development. The foundations of our morals, values and core character traits are formed in our early years. For this reason, the programs at Elite Force Martial Arts are an essential way to enhance the growth and personal development of young students of all ages. You may have experienced boredom with your usual fitness routine or reached a plateau in your performance or physical fitness results. Our adult programs are the perfect alternative to a boring gym routine, as they help you develop into your maximum potential both physically and mentally by providing real life self-defense strategies in a a fun, focused environment. Elite Force Martial Arts teaches a mixed style between Kenpo, Krav Maga, and Muay Thai. One more reason you will love martial arts at Elite Force Martial Arts! This is the best decision I’ve ever made as a parent. I love my little girl to death but I always felt like she had two left feet... but now all that is changing. The school was affordable and they had several timeslots for her to attend so that made it convenient for us. My children have been going to Elite Force for almost 3 years now. I have seen a lot of growth in their strength and endurance. The instructors are amazing and always full of energy, encouragment, and patience. We absolutely love the Elite Force family and wouldn't go anywhere else!!! Would definitely recommend bringing your child here! The instructors are always happy and excited to work with the students, you can tell as soon as you walk in they love what they are doing in life! Getting to travel around the world to Martial Art Schools, you see all the differences. This school is definitely one of the best!! The instructors and team are amazing at teaching, and amazing at their art. If you're looking for a school, this is the one to be at!!! 5 stars isn't enough! They need more stars!! What an amazing school! Followed by amazing instructors! They are so awesome especially Ms. Bingham she us the greatest! So loving and caring towards he students and school! She is an A1 Martial Arts Instructor! I have been going to Elite Force Martial Arts - Ft. Lauderdale for many years. I started off as a parent watching on the sidelines. I loved what I saw...invaluable skills and a room full of great role models for my children. As I watched my children become young adults and move into the Adult class I then noticed how much fun the adults were having too! It has been the absolute best thing I could have ever done for myself and my children. I never knew what true cardio was until I started Martial Arts! They kind of sneak it in... you are getting an amazing all over workout (including your mind!) while having a blast. Everyone is so nice.. I highly recommend this to anyone at any age. I started a year ago at 238 pounds thanks to everybody there I am at 194. The sensi's and instructors are the best out there and awesome people. I now have confidence in my myself and know self defense. The health benifits are incredible. I just want everybody's to know I will be on that stage when the time is right getting my blackbelt and always help the students that are starting. Someday I want to teach the little ones and be able to tell my story. Thanks to everyone that will help me make this happen. Elite Force you rock in more ways than you will ever know. By the way I am 63 feeling 40. Got our daughter started here over 8 years ago. Best thing we ever did for her. She has learned to respect herself and others, how to be confident and strong. The best dojo family there is!!! They got me training as well and it has been a great journey. I know it will continue for many years to come.. My daughter wants to be an instructor, because she's been taught by the best!! Team Elite Force Martial Arts is the Best!!! No better place for kids and adults to learn martial arts. It's a family atmosphere and I would highly recommend to anyone!!! Love my EFMA Family!! !